Atom is made up of 3 sub-atomic particles i.e. electron, proton & neutron. Every object that exists in 3-D has mass. Atom to have mass and the mass of an atom is very small. The mass of an atom is calculated by using sophisticated techniques like mass spectrometry. But in the 19th century, scientists could easily determine the mass of one atom relative to another atom. Initially, the scientist took 1/16 of the mass of a naturally occurring oxygen. The main reason for taking oxygen was that oxygen could react with a large number of elements, and by using Oxygen-16 the masses of many elements came as whole numbers. In 1961 carbon-12 was taken as the standard and had been agreed upon. 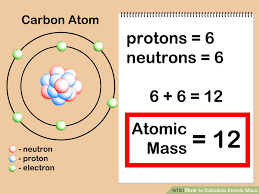 The average mass of an atom compared to the 1/12th mass of a Carbon-12 atom. Its is a mass unit. 1 amu is defined as a mass which is exactly equal to one-twelfth the mass of one carbon-12. amu is usually replaced by 'u' which is known as unified mass.